The price for Superman's debut goes up, up, and away at auction, shattering the previous single-issue sales record. Who says collecting comic books never pays? Certainly not Darren Adams, owner of Pristine Comics in Federal Way, WA. Earlier this month, Adams put his copy of Action Comics #1, which famously features the first appearance of Superman, up for auction via eBay. On Sunday, the auction came to a close with a final record setting bid of $3,207,852.00. So how did this particular copy of the Man of Steel's first outing warrant such a high price? 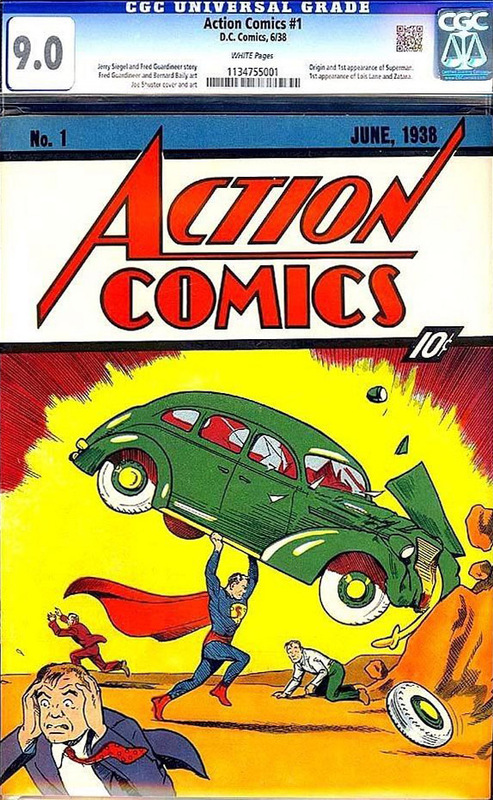 For starters, an original Action Comics #1 isn't exactly an easy book to come by. The book hit newsstands all the way back in June of 1938, and not many copies have survived the test of time. In fact, it's been estimated that there are only 50 to 100 total copies of the book still in existence today, and only 34 known original, non-restored copies. As if that's not enough, this particular copy of Action Comics #1 is one of only two to have earned a CGC grade of 9.0 by Comics Guaranty, LLC., the independent third party comic grading service. The other CGC 9.0 copy, formerly (and famously) owned by actor Nicholas Cage, previously sold at auction for an all-time record single issue comic price of $2.16M. Despite sharing the same grade, Adams' copy of the comic is regarded as the better of the two, due to its noticeable lack of color deterioration. In a YouTube video detailing the book's provenance (seen below), Adams describes how the comic was originally purchased from a newsstand back in 1938, before ending up getting stored in a cedar chest at a high altitude. The book was kept in that dry, dark environment, keeping it in pristine condition until the original owner passed away forty years later. After a collector bought the book from the owner's estate, it made its way through a couple of additional owners before ultimately finding its way into Adams' hands. Adams won't be the only person to benefit from the sale of Superman's debut comic. As an added bonus, one percent of the proceeds from the sale of the book will be donated to the Christopher & Dana Reeve Foundation for spinal-cord injury and paralysis research. Christopher Reeve was best known for playing the Man of Steel on the big screen in four separate movies from 1978's Superman to 1987's Superman IV: The Quest for Peace. Reeve suffered a severe spinal cord injury as a result of a horse riding accident in 1995, and was a driving force for research into the treatment of paralysis caused by spinal cord injury and other neurological disorders until his death in 2004. The Christopher & Dana Reeve Foundation continues to fund research and help improve the quality of life for people living with paralysis through grants, information and advocacy.